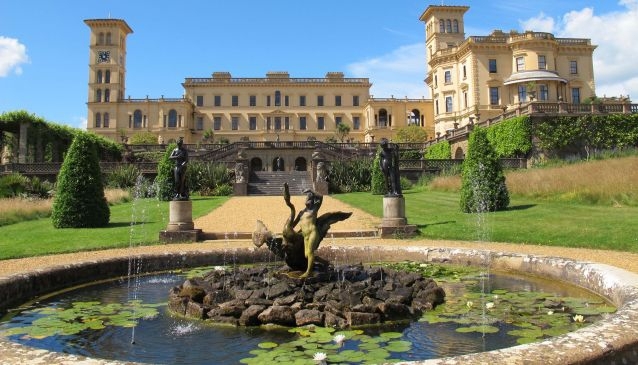 Queen Victoria wrote 'It is impossible to imagine a prettier spot' after her first visit to Osborne House on the Isle of Wight - the royal seaside palace where Queen Victoria enjoyed many of her years in reign living. She spent her happiest times here with her beloved Prince Albert and their nine children, before her husband passed away. Osborne House allows you to imagine what it might have been like in Queen Victoria's home during Victorian times, with much of the house now open to visitors. See the grand reception rooms with views over the beautiful grounds and out to sea, along with the more private and intimate glimpses of royal life in the bedrooms and children's nursery upstairs. Imagine the hustle and bustle of the servants quarters downstairs and wander through the immaculate gardens outside. The interior has been extremely well maintained, with original furnishings, priceless artworks and some items that still belong to The Royal Collection. The grounds are immense and beautifully maintained. However, although large you can also appreciate the love and devotion that the Queen had for her Isle of Wight home, with personal touches such as a mini fort play area for the children and well thought out areas and hideaways. Queen Victoria's beach is also now open to the public, which is a 20 min walk from the house. A mini bus also runs in order to help people get around the grounds. There are various Osborne House events throughout the year. Our favourite annual event is A Victorian Christmas, giving you the chance to experience the magic of Christmas time at Osborne House. Did you know that you can stay at Osborne House in their Pavilion Cottage?